Since ancient times, the twinkling of the heavens inspired people across the globe to create stories that answered the most important of questions: "Who are we… and how did it all begin?" Open this box, and join the storytellers of old. 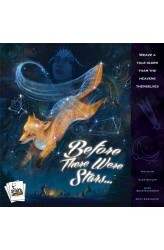 Before There Were Stars... is a storytelling game in which each player tells the mythic creation story of "their people". Inspired by constellation cards, players craft tales about the creation of the world, the origins of civilization, the rise of a great hero, and the end of days. This "feel-good" game lets you appreciate the boundless imagination in all of us and awards points for the best story moments — allowing everyone to shine regardless of their skill as a storyteller. 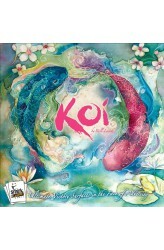 Playing this game is a breath of fresh air that never repea..
As a koi fish, you spend your days (turns) swimming to and fro by playing a number of movement cards, with the goal of gobbling up as many dragonflies and frogs as you can every day. Each movement card has from two to four programmed moves — straight, turn, rotate any direction and leap over a space — with some moves being mandatory when played and others being optional. Your tranquil koi pond begins with some decorative stone and a few lily pads, but you will also receive natural beauty cards in your hand that allow a player to add more lily pads, cherry blossoms, ornamental stone and frogs — which both enhances the beauty of the pond and causes turmoil beneath the still waters for the other koi. Lily pads are great as they spawn dragonflies every turn, each of which is worth 3 vic..